Life can be ironic sometimes. I moved to France to ride the open road, but where did I find myself pedaling today? In the corner of my living room. Here’s what happened. See, last year I shaved my legs and from that point on I started doing all sorts of odd things, like using the word ‘fartlek’ more in one year than really should be necessary, or having meaningful conversations on the relative merits of chamois cream brands. Recently, you’ll remember that I received a heart rate monitor and cadence thingamajig. Now, the transformation is complete and I guess I can be officially considered ‘a cyclist’. An indoor trainer came in the mail this morning. Yes, there is the little matter of doing the actual training that Coach Rob has prescribed, but looks are important and having a bicycle taking up a good portion of your living space must be considered impressive. I already have some things to say about this new contraption, but I’ll save that for another article. Until then, if you have any favorite cycling videos you’d like to recommend, I find I have lots of viewing time these days! 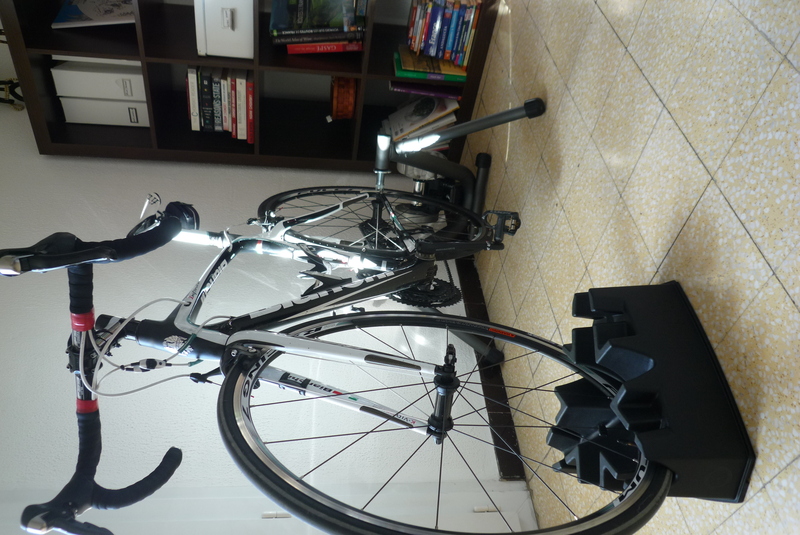 This entry was posted in Cycling and tagged indoor trainers. Bookmark the permalink. Good stuff! How loud is it? Purrs like a loud kitten. I need to turn up the volume on the video tomorrow, for sure. Welcome to the dark side of training. No doubt it will become the contraption that you’ll “love” to “hate”. “Love”, because of the results and the appreciation for the open road and “hate” because it is the giver of pain and mind numbing boredom. And, if my experience is anything to go by, absolutely buckets of sweat, since you won’t have a nice breeze to aid the evaporation. And shredded tyres if you don’t get special ones. Attach it to a generator so you can at least get some useful product from the pain. I had the window open, but to little avail. Good suggestion about the generator. I should harness all this power I will surely be producing soon! Is it a Kinetic unit? It looks very much like mine, which is in my tiny pantry. With this many of us spending so many hours inside on contraptions there must be some high tech way to make the whole bigger than the sum of the parts. You want videos to watch, not training videos, right? How about old TdF clips? 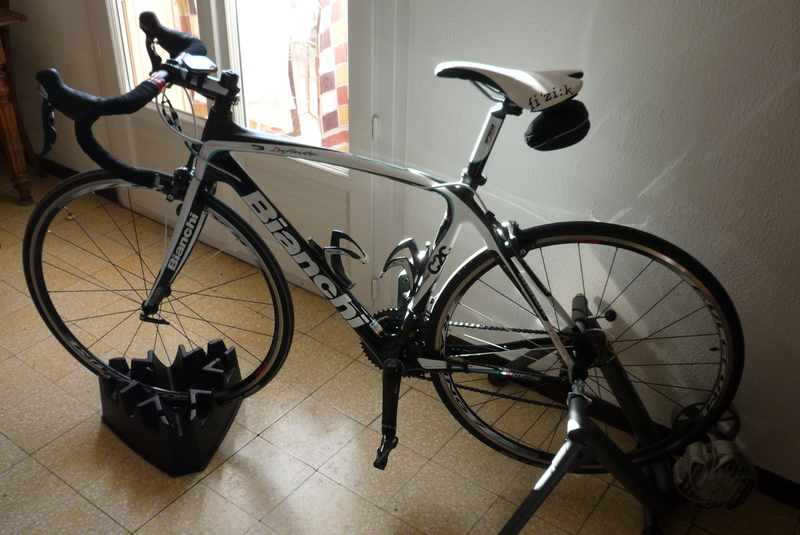 How does your Bianchi like it? I read somewhere to throw a towel over the frame to protect the finish, but don’t give it much credence. Lucky, you know, I also read somewhere that “girls” don’t sweat. Nope, it’s a CycleOps Fluid2. Is the Kinetic the one that rocks back and forth? That looks pretty cool. Do you have any favorite TDF stages or summaries, etc? I’m current watching a complete stage (French TV, stage 14 – 2000) which is great because it’ll take 3 or 4 workouts to get through that one video. The Bianchi is dealing well with it all fine at the moment. My knees however, are a different story. Thanks for the towel tip. I have one on the bars now, which is more than a little handy. I can’t say I envy you. Although this is certainly the better route to get you to your ultimate goal, I cannot think of this as “cycling” or “time on the bike.” It is merely a training activity that will prepare to achieve a cycling goal some day. Best of luck! You’re right Steve, but you can be sure that when I total up my mileage at the end of the year I’ll be including those not-time-on-the-bike hours! Unfortunately, unhappily, sadly or ridiculously, all I can do when I’m “training” on the stationary set up is pay attention to HR, cadence, gearing, or some other thing. Loud music works for me. Books or videos don’t. I lose focus and slack off. Oh God, not that! So, TdF tpaes were just an idea for you. I know what you mean about videos. I can’t seem to keep my head up for more than a few seconds at a time. Maybe I need to set up my computer on the floor in front of the bike..
a definite plus one for the sufferfest. Don’t use the turbo much, but these are the only thing that makes it bearable. If you have an iPod/iPhone you could look at getting a bracket for the handlebars, sufferfest videos can play on those, might make life a bit more enjoyable! Make sure someone else in the house is toasting bacon sandwiches at the same time – that adds to the pain. And Pain is Good, right? Funnily enough a caff near me has “Pain Cafe” as it’s neon…….but no bacon. Bacon…yum. No chance of that in this household, I’m afraid. And I’m trying to find the goodness in my pain now. Any hints on what I should be looking for..? You’re very dedicated. I’ve tried indoor pedalling but it was miserable. I missed flies gluing themselves to my eyeballs and being forced off the road by lorries too much I think. Not a patch on the real experience. I went out today and I’ll be out tomorrow. Unfortunately no flies this time of year, but I’ll hope for trucks. Nothing like the real thing! Andrew, thanks for that. Robert Millar and Pantani are two guys I’d like to learn more about. Just too bad YouTube videos are so short. On the other hand, gives me a good excuse to get off the bike every 10 or 15 minutes to switch videos! A few of those will add some welcome change of pace to the Carmichael Training Sysem DVDs I most frequently use. Hadn’t seen the site before, so thanks. Happy pedaling!